In words, it goes like this: From an existing or new Sprint site or Mobilitie somewhere a radio signal is transmitted outwards. Nearby Mobilitie sites pick up the signal with a device called a UE relay (User Equipment Relay). From there the signal is sent to a remote radio unit (“RRU”), which converts the incoming signal from the UE Relay to Sprint frequencies. From the RRU, two coaxial cables connect the RRU to the antenna on Sprint’s frequency, and on to Sprint’s customers. There is also an electrical power distribution box to power the UE Relay and RRU. In the case of the City of Los Angeles, electrical power is tapped off of the street lighting power circuit. Where that’s not an option, Mobilitie may have to install a power company electrical meter somewhere on the light standard, or nearby in a meter pedestal. 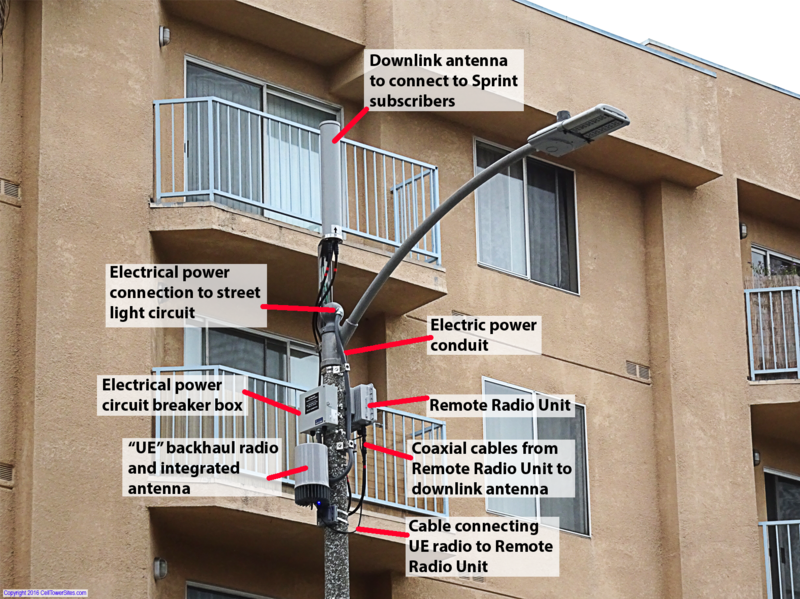 Here’s what a newly installed Mobilitie (sorry, Interstate Transport and Broadband) site looks like in Los Angeles, with call-outs to identify what I’ve described above. If you’d like to see more photos of new Mobilitie sites in Los Angeles, visit CellTowerPhotos.com. Pretty, eh? Naw, I don’t think so, either.